Many of you know that I simply love open wheelers and track day toys. A few months ago, KTM announced the development of a new race car in conjunction with Reiter Engineering, which we know mostly from its Lamborghini FIA GT racers. KTM teased us with a rendering. Based on the X-Bow, the renderings showed the exterior getting a fully enclosed cockpit, some serious wheel arches and a giant wing hanging off the back. The front aspect similar to that of the of the Gumpert Apollo. It did not have a name yet, but it was being engineered to run in both the SRO GT4 European racing series and the GT-S class in the Pirelli World Challenge. The Audi-sourced 2.0-liter TSFI petrol engine (Volkswagen derived) that produces 320 hp of maximum power and comes mated to a 6-speed sequential gearbox. 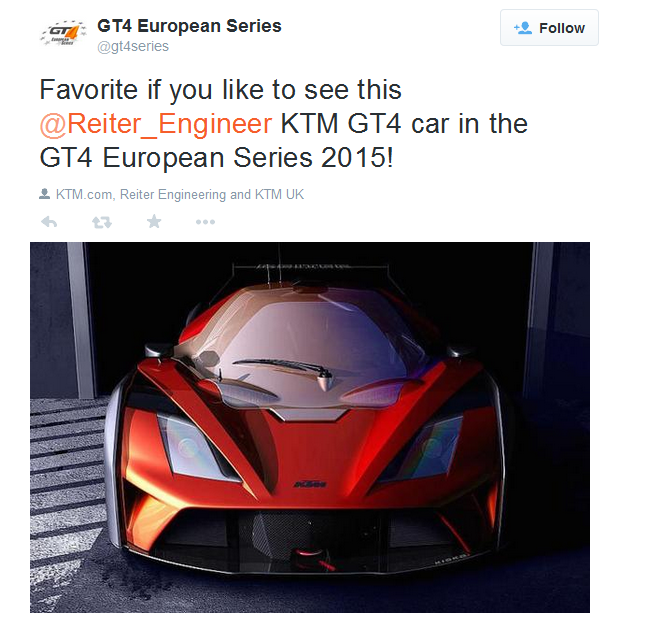 15.12.2014 - The announcement from Reiter Engineering GmbH & Co KG and KTM Sportcar GmbH that they are working on a new KTM racing car has caused quite a stir in the racing scene. Now there are further details for all those interested in putting their trust in a GT4 racing car from Reiter Engineering in the coming year, one that is homologated from SRO and Pirelli World Challenge. Hans Reiter, proprietor of Reiter Engineering explains further: "In the first stage we homologate the new racing car for both the SRO GT4 and the Pirelli World Challenge GT-S classes!" The new KTM racing car will generate approximately 320hp with the well-known 2.0 liter TFSI engine, which is coupled with a sequential six-speed gearbox from Holinger, naturally with paddle shift. "In addition there is also a racing ABS system. When it comes to the weight we are orienting ourselves on the current SRO GT4 practice. Ultimately however we have to wait to see how much balance weight and horsepower the SRO and the Pirelli World Challenge assigns us as part of the 'Balance of Performance'." Price-wise the GT4 racer, which is exclusively prepared and available from Reiter Engineering, should be in the range of the SRO rules for GT4. According to Reiter, "When you reflect on what the customer is being offered here in terms of the most modern racing technology, together with a very impressive safety concept, then you can really speak about it being exceptionally good value for money. Since the new car is based on the KTM X-BOW, the customer is going to get a racing car that has now been tested on the world's racing circuits for six years. Our next major milestone will be the SRO BOP test in the coming spring." The joint racing project of Reiter Engineering GmbH & Co KG and the KTM Sportcar GmbH is taking on ever more concrete forms. The first roll-out of the new vehicle is set for February, in March will see the SRO “Balance of Performance” test, and in spring the GT4 racing car will be available for the numerous customer teams that have expressed an interest. As of now, both the name and the price have been fixed: The KTM X-BOW GTR will be available from April at € 139,000. As with all KTM vehicles, Austrian design studio KISKA was responsible for the design development of the KTM X-BOW GTR. 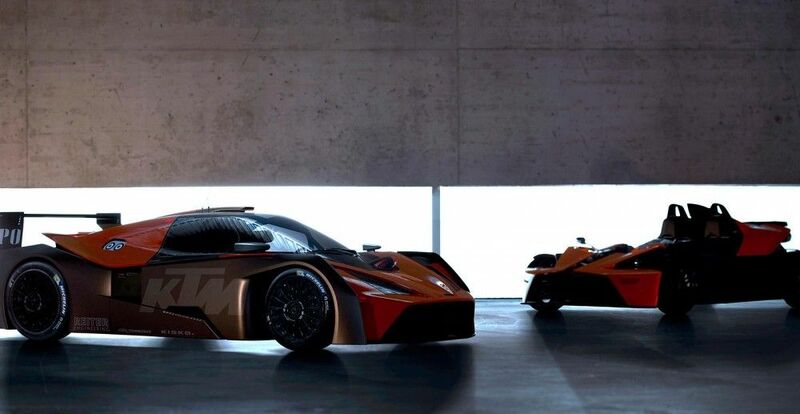 The studio also played a key role in designating the new KTM X-BOW as a “GTR”; a class of vehicle with a rich motorsports heritage that possesses much cachet amongst automotive enthusiasts. 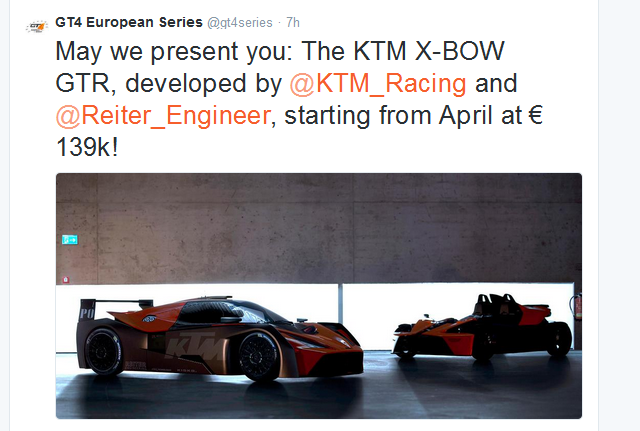 By creating the X-BOW GTR, KTM is also taking an important next step in the ongoing evolution of the X-BOW. 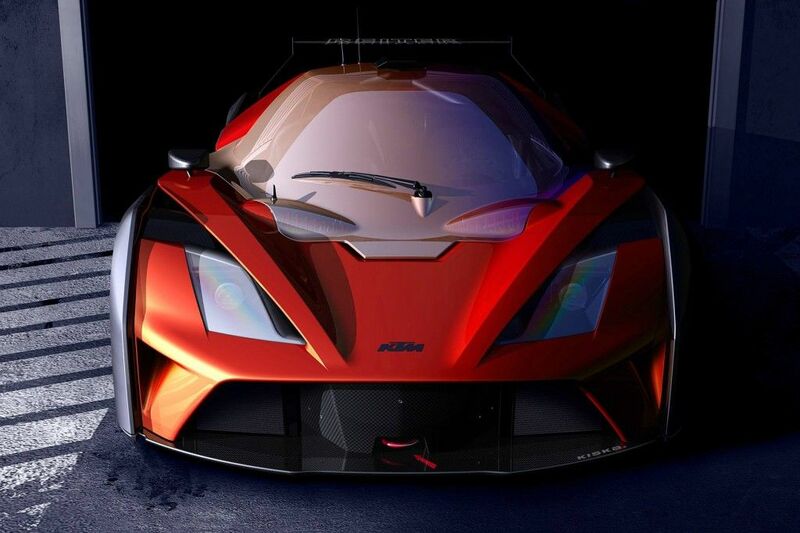 The brand launched the KTM X-BOW R in 2009 and the KTM X-BOW GT, which features a wraparound windshield, in 2013. The addition of a third iteration of the KTM X-BOW, one that is fully covered and “Ready to Race” is the next logical step in the vehicle’s development.